For tall fescue lawns between 3.5 -4 inches. Bermuda & Zoysia Lawns Between 2.5-3 inches. It is very important to continually remove all leaves and debris from the turf during the fall season in order to promote & encourage a healthy lawn through winter. 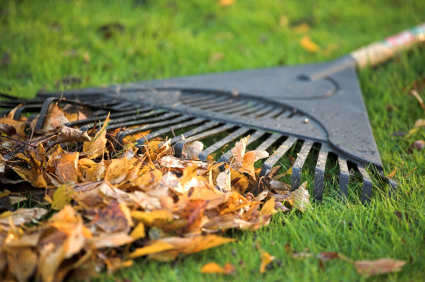 Use a leaf or overseeder rake but be careful not to rip out existing grass. It is important to aerate lawns to encourage good root development before winter. Aeration helps loosen compacted soil and create a better grass growing environment. Aerating and dethatching are best done when a lawn can take some abuse and recover easily. Fall is perfect due to the cool air temperatures and warm soil temperatures. Dethatching and aerating should be done before over-seeding to ensure the seed makes direct contact with the soil. Homeowners and landscapers can now rent from a large selection of machines that have attachments for de-thatching, spike aeration, and core aeration (for very compact soils with low water drainage). If there is excess thatch present, use a dethatching rake to eliminate the dead matter. Use a Starter Fertilizer for optimum seed germination and quick establishment. Autumn is the best time of year to seed lawns. Newly germinated grass seedlings have a greater chance of survival in the cooler season. Use a hand spreader for smaller areas and a larger broadcast spreader for larger lawns. For a more even spread, apply half in one direction and the other half in the other direction. Rake lightly with a leaf rake to ensure good seed to soil contact. Use the back end of a rake to press the seed down to avoid wash out from water run-off. Water on a regular schedule to make sure seed and soil stay moist. Sunny locations and dry weather will require you to water more frequently. Using a timer will help you achieve an even growing environment.